Ever noticed that the screen of your iPhone Xs, X or 8 is not as bright as it should be? Do not worry! 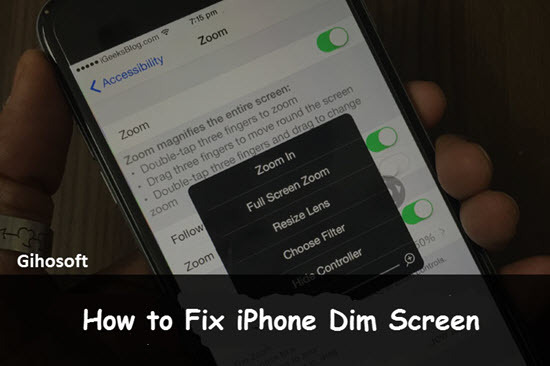 There are always solutions to fix your iPhone screen dim problem. While there are a lot of factors that affect the brightness of your screen, the usual suspects for this problem happening are due to mistakes in the configuration or a diverse set of software glitches. The good new is there are a lot of actions that can help solve it right away. And here we list 7 useful tricks for you to fix the iPhone dark screen as below. Bonus tips: If you want to recover deleted important data like messages or notes from iPhone, you can always use the professional tool Gihosoft iPhone Data Recovery to get them back even without any backup. Before you do anything else, you should do easy troubleshooting steps first to address the issue. The dim screen issue could just signal an underlying minor software problem that can be fixed with a simple action. Firstly, reboot your iPhone by holding the Home and Power buttons at the same time. Let it go the moment you see the Apple logo appearing on screen. 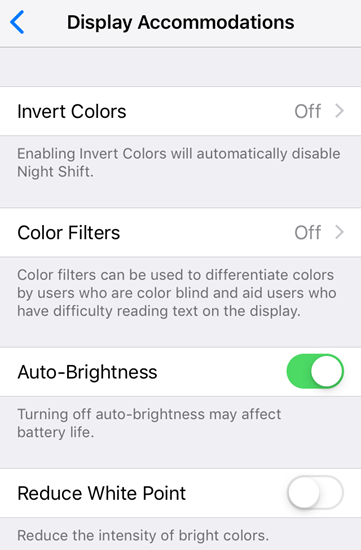 Secondly, adjust your phone’s brightness in the Settings > Display & Brightness. Drag the brightness slider depending on the level you want. Your constant use of auto-brightness could be messing up with both of your hardware and software on iPhone. Try to turn it off and see if that is the problem causing the dim screen issue. Go to Settings > General > Accessibility Display Accommodations (iOS 11&12). Here you will find the option “Auto-Brightness”, then switch it off if it’s on. 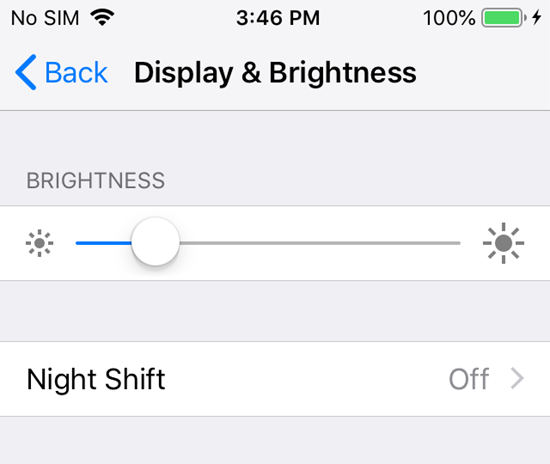 Now you can easily increase the brighness of you iPhone screen in the Settings or the Control Panel. You can also restart the phone for refreshing. 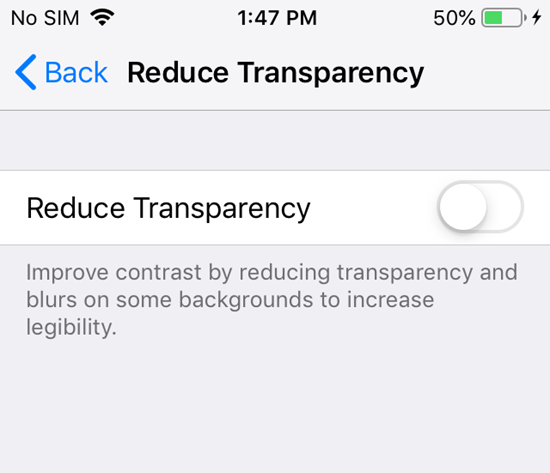 Reduce Transparency is one of the more polarizing features of iPhone. It has also been pointed out as one of the likely causes of the iPhone dark screen issue. Open your Settings > General > Accessibility > Reduce Transparency. Toggle it to off if it’s on. The White Point feature is typically used to decrease the intensity of bright colors of iPhone screen. If you have turned it on, you will find that your phone screen will be darker than normal. However, this may also result in the dim screen problem, which is why it should only be used sparingly. Go to Settings > General > Accessibility on iPhone. Once you are in there, disable Reduce White Point. The Invert Colors and the Color Filters are not exactly the most commonly-used features in iPhone. But you should still check as they do affect how your screen displays light. Open your Settings > General > Accessibility on iPhone. Look for Display Accommodations and click into it. Locate the option Invert Color and the Color Filters. Turn both to off if they are on. One of the most common reasons why the dark screen happens is that the ambient light sensor is malfunctioning. The ambient light sensor is a part of your iPhone that helps in adjusting the screen light according to the environment it is in. To fix it, try to lock and then unlock your iPhone. This may solve the issue as the sensor may not properly work when you lock/unlock it regularly. The dim screen issue could also be caused by dirt and dust gathering on the iPhone case. You may want to remove the case and then clean it off. If you have already done the five previous steps but the problem is still there, you may want to turn off your Zoom. A few users have said that the problem was solved the moment they switched it off. 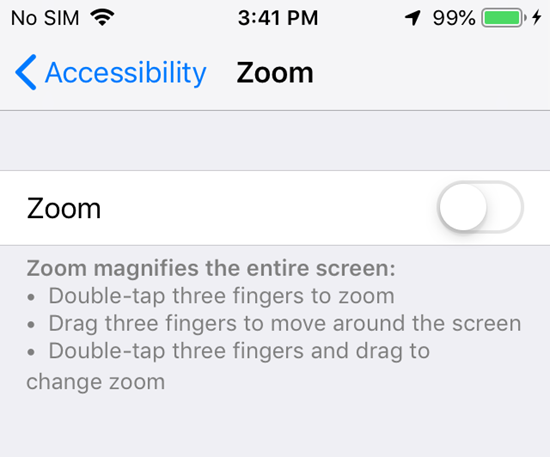 Find Zoom in the Accessibility option. Reverting the iPhone’s settings back to its original state is also a good way to fix some operating issues like dim screen. Though it will not delete any data or media but reset all settings including brightness setting and WIFI connection, you are recommended to make a backup in advance. Scroll down and find Reset. Tap “Reset All Settings” and enter your passcode to confirm this action. If things do not work, then your last choice is to contact Apple Support. The company has one of the best customer service departments in the world so you will be sure that they will have a solution for you. Getting a dim screen issue on your iPhone can alarm even the most experienced iPhone user. Thankfully, there are a lot of steps that you can take to solve the issue yourself. If you have any question or suggestion while dealing with this, welcome to contact us by commenting down.